Earlier this year I started researching into the life and works of Professor Mariano Cubí y Soler as a Lord Baltimore Fellow at the Maryland Historical Society. During this time, I have learned a great deal about professor Cubí y Soler, an innovative and distinguished scholar in the nineteenth century in the United States, Latin American, and Spain. In this article, I offer an adapted version of my entire research and focus only on professor Cubí y Soler’s transcendental works and legacy in the field of Spanish language instruction in the state of Maryland. 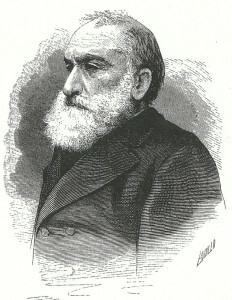 Mariano Cubí y Soler was born on December 13, 1801 in Malgrat de Mar, Spain. His father was originally from Italy and his mother was from Igualada, Spain. Cubí’s childhood was marked by the civil and political unrest of the Napoleonic period. When he was only 8 years old, the difficulties caused by the war with the French forced his family to move to Mahón in the island of Minorca, Spain. (1) He completed his primary and secondary education in Mahón and became fully fluent in the Mahones language. At 14 years old, Cubí began studying English and French out of his own personal interests for languages and philosophy. His English instructor was distinguished professor William Casey, who proposed an innovative teaching style at the time for foreign language teaching that included idiomatic phrases and everyday activities as a means to learning the language. (2) On March 2, 1821—at the age of 20—Mariano Cubí y Soler moved from Spain to Washington DC. 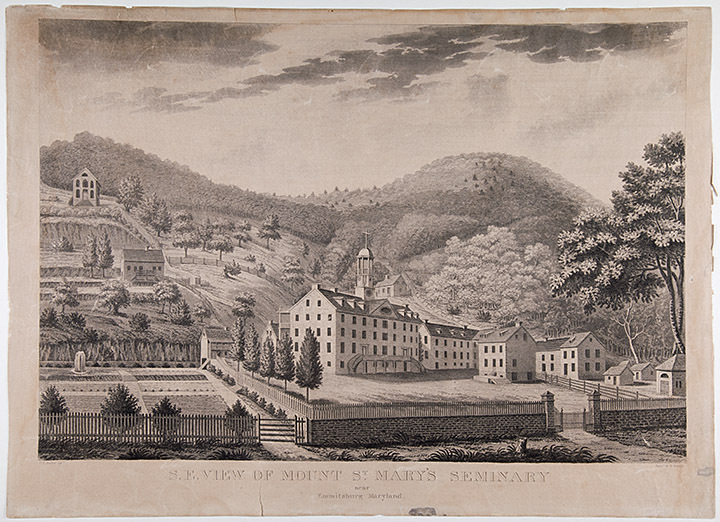 Months after his arrival he was offered the position of Spanish professor at Mount St. Mary’s University by Mr. Edward Damphoux, president of the university at the time. 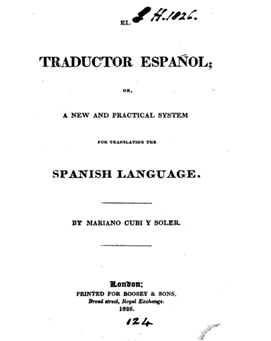 Cover of “Traductor español; or, a new and practical system for translating the Spanish language,” 1826, by Mariano Cubi y Soler. Luis Javier Pentón Herrera, M.Ed., M.S., M.Ed, is a Ph.D. Candidate in the Leadership: Reading, Language and Literacy program at Concordia University Chicago. His current research focuses on Bilingual Education, Spanish, ESOL, Adult Education, Literacy Studies, and History of Hispanic Pedagogues. He was a MdHS Lord Baltimore Fellow in 2016. (1) López Gómez, José Manuel. “La frenología: Una doctrina psicológica organicista en Burgos. El Canónigo Corminas y Mariano Cubí”. Boletín de la Institución Fernán González, 1, (1994), pp. 67-85. (2) Marco García, Antonio. “Traducción y literatura en los manuales de Mariano Cubí”, in Neoclásicos y románticos ante la traducción, eds. F. Lafarga, C. Palacios, & A. Saura, (Universidad de Murcia: España, 2002), pp. 165-184. (3) Leavitt, Sturgis E. “The teaching of Spanish in the United States”. Hispania, 44(4), (1961), pp. 591-625; Spell, Jefferson Rea. “Spanish teaching in the United States”. Hispania, 10(3), (1927), pp. 141-159. (4) Ibid, Leavitt, pp. 591-625; Herbermann, Charles George. Historical records and studies: Volume VIII. (New York, NY: The United States Catholic Historical Society, 1915). (5) Ibid, Leavitt, pp. 591-625; Spell, pp. 141-159. (6) Arañó, D. Miguel. “Biografía de D. Mariano Cubí y Soler: Distinguido frenólogo español” (1876). (9) Marco García, pp. 165-184. (12) Marco García, pp. 165-184; Cubí y Soler, Mariano. Gramática de la lengua castellana adaptada a toda clase de discípulos, a todo sistema de enseñanza, y al uso de aquellos estrangeros, que deseen conocer los principios, bellezas, y genio del idioma castellano. 1824. Baltimore, MD: José Robinson. Cubí y Soler, Mariano. Extractos de los más célebres escritores y poetas españoles. (Baltimore, MD: José Robinson, 1822). Cubí y Soler, Mariano. El traductor español; or a new and practical system for translating the Spanish language. (London: Boosey & Sons, 1826). Herbermann, Charles George. Historical records and studies: Volume VIII. (New York, NY: The United States Catholic Historical Society, 1915).